This table shows the advancement in academic years experienced by the entire student body at St. Andrew's Country Day School, Buffalo, NY. The advancement was measured using the "value added" TerraNova standardized test as published by McGraw-Hill. The students were taught using the Project Renaissance Maieutic Socratic Methods, mainly in the 2008-2009 school year and in following years. In 2007-2008, some of the teachers were taught and were already using some of those methods, which accounts for some of the gains you see for that year; but note how these gains accelerated once all teachers were using these methods. In 2007-2008, with some teachers using and some not yet using these methods, day-by-day usage was logged, and the gains—student by student—correlated nearly perfectly with the proportion of classroom time in these methods experienced by each student. Starting in 2008-2009, notice how—once students are more verbal, from 5th grade on up—gains also accelerate there. Judging by reports from individual teachers, including at college and graduate levels (though as yet not subjected to standardized and systematic testing), that acceleration continues, or certainly at least that higher level of performance gain continues, throughout all higher ranges. Approximately 200 students each year were tested in the study. which your students are gaining, even without the investment expense of the professional training which can carry your school even much further. 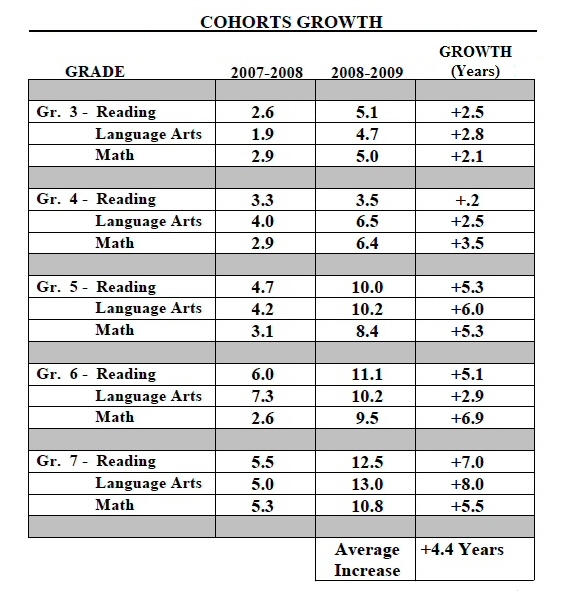 The averages are currently running at or above those for the 2008-09 school year. The 2007-08 year was really only a little more than a semester, after we got to teach a third of the faculty at that time who then used the method. That partial, 2007-08, year was figured together with the whole 2008-09 year to make the gains that you see noted there for those two years. We will soon post more and later test results here. Note: Though without formal standardized testing as yet, similar quality gains have been observed in several university graduate science courses, demonstrating that the usefulness of our maieutic Socratic Method extends across the full educational range. How To Teach Smarter—Not Harder! These three very easy tactics, immediately self-taught in specifics from this book, are only part of the very comfortable modern form of Socratic Method which has been getting such nice results at St. Andrew's. Even so, their easy incorporation into your routines should easily and immediately more than double your students' rate of gain in academic proficiencies, though still short of the whole five-fold-plus gain. We can then provide you other elements for the rest of that greater gain. Discover how very easy and relieving(!) it is, for both teacher AND students, to facilitate your varied students into making their own meaningful associations with current learning materials instead of trying to do it all for them—respecting the basic principle that nearly all learning, especially human learning, is in fact by making associations with one's own other and previous experiences. Your review of and reactions to this 3 Easy Tactics book are profoundly appreciated. If you try out any of the 3 easy tactics in your own classroom and give us your detailed observation of the results, we have a valuable further gift waiting to give you. Two of those three easy tactics each take only a minute to learn and apply. Each use of each tactic, within reason, should more than double the value of the lesson for which you've used it—especially if, instead of mere memorization, that lesson entails some intellectual, scientific, aesthetic or human understanding. If, instead, you are facilitating a problem-solving session, the effectiveness of that session should also be more than doubled thereby—since both creative problem-solving and learning-with-understanding are essentially the same process, that of figuring things out, and mostly the same methods will serve both well. Special Note: Wherever in the world you are, within moments from now you can have in your immediate possession the ebook download version of 3 Easy Tactics, directly from the publisher, no shipping cost. Or order the printed book from the author and receive, in addition to the book, some brilliant bonus information relating to educational methods.